Question about receivers for DX6i TX.. I have a question..actually, I have a lot as I am newbie, but I'll keep it down to one. I am using a Dx6i Spektrum Tx for my Super Cub and I need to know about receivers. I am planning to build a kit plane this summer and I'm going to use the Tx that I have. Does the receiver that's going into the kit plane have to be a Spektrum, or do I have other options? I just don't know and I'd like to find out before I spend my money on something I can't use. Thanks a lot and I really love this site. Comments for Question about receivers for DX6i TX.. Yes, your new aircraft must use Spektrum or JR branded RX. Each manufacturer (Futaba, Horizon Hobby, Airtronics, Hi-Tech, etc...) have their own slight differences in communication protocols. I believe there were some modules built for Futaba to work with Spektrum/JR (Spektrum and JR are sub brands of Horizon Hobby and thus are compatible), but I've never used or seen them used. Now comes another question, what specific RX will you need for the aircraft? The answer to this one depends on the functionality and size of the aircraft. You'll want at least 4 channels (throttle, rudder, elevator, aileron). If this is all, then any 5 or 6 channel RX is sufficient. But then comes the size of the aircraft. If the wingspan is over the qualifications of a ParkFlyer then you will need the AR6200, AR6250, or AR5000. If the wingspan qualifies (and is electric powered) then the AR6110 or AR6110e is perfect. The difference between the two groups of RXes is their range. The larger the aircraft is, the more range you'll need because you'll find yourself flying further away. If you are adding up to 2 more features (say flaps and retracts) then a 6 channels RX is all you need. Thanks for the info on the Rx question. Next, I'd like to know about servos....does brand matter, or is it just a matter of using the proper ones for the proper job. The kit that I want to get is the Electricub II from Great Planes. WS is 58.75" Motor and ESC/BEC I'm not sure of...yet. Thanks in advance for all the help...it makes this hobby a lot more fun when you get things explained properly. I have the DX6i transmitter also. Just broke the darn antenna today, arrrgh... Hopefully I can buy a new antenna... I bumped it against the shelf really hard when I was picking it up. Anyway, the Dx6i will work with any receiver as long as it is a "DSM2" receiver. DSM was the original spektrum technology and it was only for parkflyers. 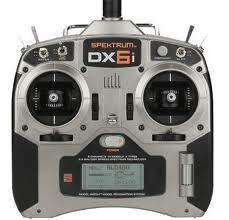 Spektrum DX6 uses DSM. For all intents and purposes, consider DSM as obsolete. Spektrum Receivers and their applications that will help you make a decision. But Parkzone servos are the only ones I've ever had compatibility issues with. Hi guys...really want to thank you for all the info regarding receivers and servos....think I'll go with spektrum everything to avoid any compatability issues that could arise. So as far as a ESC/BEC goes, are they all part of the Rx or am I talking a completely seperate unit? I think the one on my Super Cub is all in one. Hobby Zone uses what many people refer to as "bricks". They combine the receiver and ESC into one unit to save money. This also includes the BEC. The Aerobird I learned to fly with even included the servos in the brick! All of my electric planes are fairly small so I can fly safely at the local park when I don't fee like driving 45 minutes to the club to fly my glow planes. So all the ESC's I use have internal BEC's. There are a couple of reasons to use external BEC's. If you have a large plane that uses many servos, then an external BEC is preferred so you take the load off the ESC, reducing heat etc. Another reason to use an external BEC is to reduce the risk of an out of control airplane. If the ESC and BEC are in one unit, and you fry the ESC because you ran too much current then you will loose all control and your model will crash. You loose the model and possibly hurt someone. If the BEC is separate and you fry the ESC, you will still have power to the receiver and servos so you can dead stick land safely. I'm the same person who left the first response to this question. To answer your question about branding on ESCs and servos. No, they are not required to be the same as the RX and TX. However, not all plugs are interchangeable. For example, to use Futaba servos with JR/Spectrum RX, the female adapter on the servo wire has to have the small tab trimmed off. But to be extra safe, use all the same brand. Remember JR and Spektrum are the same company (Horizon Hobby) so all the JR and Spektrum gear is 100% interchangeable. I'm just starting to get involved with electrics after flying glow for 10+ years. So I don't know details of ESCs. But if you go to the LHS (local hobby shop) and tell them the RX you're using, they'll know what type of female adapter you'll need for everything. That's a good point about the servo plugs. I too also try to stick with the same brand. But if you already have the servos lying around you can usually interchange them between brands without a problem. Just do a thorough check before flight to make sure all is well. There is a chart at the bottom of this RC servos page that depicts the plugs the last poster is referring to.